it out. Additionally, Dennis will be explaining the same ins and outs in an upcoming episode of Planet Underground TV (www.planetunderground.tv). The main problem is education. 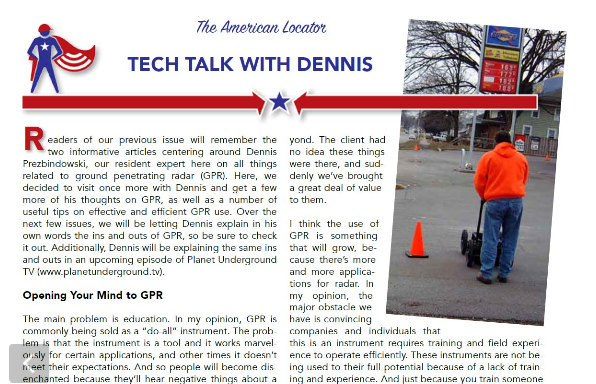 In my opinion, GPR is commonly being sold as a “do-all” instrument. The problem is that the instrument is a tool and it works marvelously for certain applications, and other times it doesn’t meet their expectations. And so people will become disenchanted because they’ll hear negative things about a GPR unit being used out in the field, but it’s coming from a person who isn’t fully educated and trained in how to use it. So a lack of education and bad word-of-mouth has put a negative cast on GPR, and convinced people not to buy it or utilize it. what exactly you need from a GPR to do the work you’re entrusted to do. I’ve put hundreds of miles in on a GPR system at countless sites and I learn something new every time I go out. For instance, a huge application that seems to be massively underutilized is using high frequency ground penetrating radar to image the internal parts of concrete structures. There have been sites that I’ve worked on where we’ve done EM and radar work and discovered features in the subsurface that were of critical importance in terms of real estate transactions, reconstruction and construction projects. I’ve done many projects where my clients were startled by what was found in the subsurface by the GPR. This stuff could range from hazardous to non-hazardous materials and beyond. The client had no idea these things were there, and suddenly we’ve brought a great deal of value to them. I think the use of GPR is something that will grow, because there’s more and more applications for radar. In my opinion, the major obstacle we have is convincing companies and individuals that this is an instrument requires training and field experience to operate efficiently. These instruments are not being used to their full potential because of a lack of training and experience. And just because you train someone does not mean that they can be a good operator or a good GPR imager, it requires a certain personality type, one that is a methodical problem solver. CHECK OUT MORE OF THIS STORY IN THE CURRENT PREVIEW VERSION OF THE AMERICAN LOCATOR! Previous Previous post: Digging by hand is for locators too!